About 10 years ago, I traveled with the producers of the Hollywood film on Che Guevara—starring the actor Benicio del Toro and directed by Steven Soderbergh—to Miami to obtain further information for the movie about the circumstances of Che’s execution. At a restaurant in Little Havana, the stronghold of the anti-Castro exile community in the United States, we met with Gustavo Villoldo, who had been the senior Cuban-American CIA operative assigned to Bolivia in 1967 to assist in tracking down and capturing the iconic revolutionary. Villoldo arrived carrying a thick white binder, filled with memorabilia of Che’s execution on October 9, 1967—original photographs, secret telexes, news clips, and even the official fingerprints taken from Che’s dead hands. The scrapbook recorded the historic results of the CIA’s covert efforts to train and assist the Bolivian special forces in eliminating Che and his small band of guerrilla fighters. In macabre detail, the retired covert agent described his discussions with Bolivian military officers when Guevara’s body arrived, via helicopter, from the pueblo of La Higuera, where he had been captured and shot, to the Bolivian town of Villegrande. 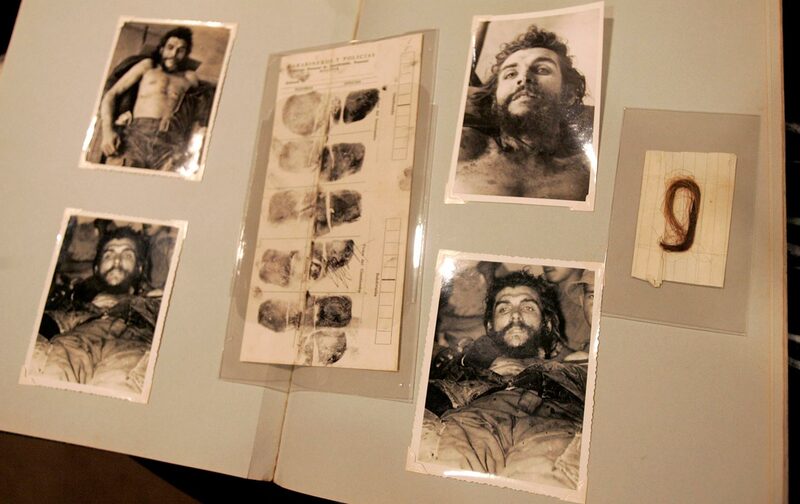 The Bolivians wanted to cut off Che’s head, he said, and preserve it as proof that Guevara was dead and gone. According to Villoldo, he convinced them instead that they could create a “death mask” of plaster, and that cutting off and preserving Che’s hands would be sufficient evidence. Villoldo explained how he arranged to secretly bury the body where it would never be found. Indeed, for 30 years Che’s remains were “disappeared”; in July 1997, his bones, minus hands, were located in a makeshift grave alongside an airstrip on the outskirts of Villegrande. 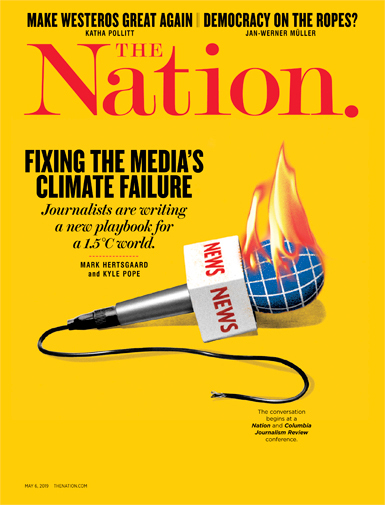 A version of this article appeared in Spanish in Proceso magazine in Mexico. Fifty years ago, US officials shared that sentiment. They considered the capture and execution of Che Guevara as arguably the most important victory of the United States over Cuba and Latin America’s militant left during the era of US intervention and counterinsurgency warfare in the 1960s. Top CIA and White House officials drafted numerous secret documents analyzing the significance of Che’s demise—for Fidel Castro and Cuba, and for US interests in blocking the spread of revolution in Latin America. 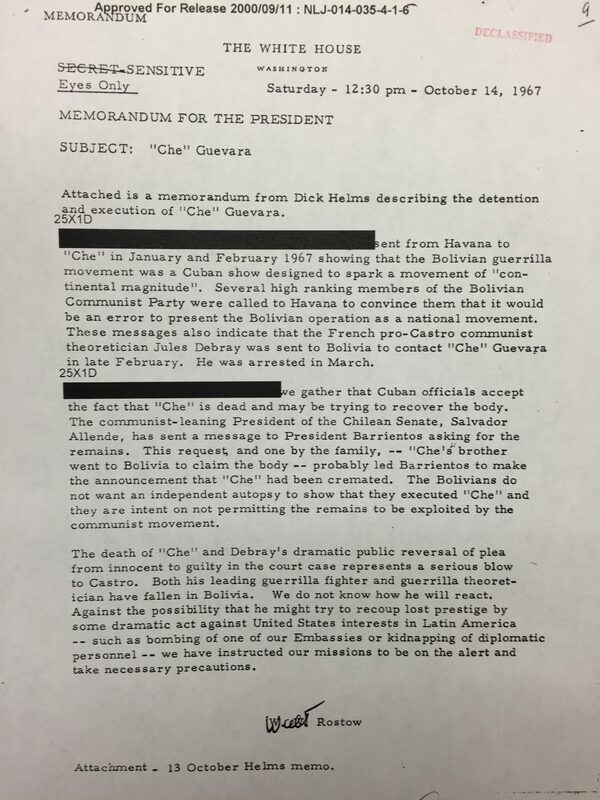 The White House memo also confirmed that the Bolivian government was covering up its role in Che’s execution by claiming his body had been cremated and could not be repatriated to his homeland of Argentina, or to Cuba. Che’s brother, Roberto, had traveled to Bolivia to ask that his corpse be turned over to the family; the socialist senator from Chile Salvador Allende had formally requested that the body be turned over to Chile, which Washington interpreted as an effort by Fidel Castro to recover Che’s remains. “The Bolivians do not want an independent autopsy to show that they executed ‘Che’ and they are intent on not permitting the remains to be exploited by the communist movement,” President Johnson was informed. “The death of Guevara carries these significant implications,” White House aide Walt Rostow reported to Johnson in a separate memo to reinforce this point. It marks the passing of another of the aggressive, romantic revolutionaries like Sukarno, Nkrumah, Ben Bella—and reinforces this trend. In the Latin American context, it will have a strong impact in discouraging would-be guerrillas. It shows the soundness of our ‘preventative medicine’ assistance to countries facing incipient insurgency—it was the Bolivian 2nd Ranger Battalion, trained by our Green Berets from June-September of this year, that cornered [Guevara] and got him. How would Fidel react? US officials worried that “he might try to recoup lost prestige” by undertaking a dramatic act against the United States—“such as bombing one of our Embassies or kidnapping of diplomatic personnel.” The State Department sent a precautionary security alert to US ambassadors in the region. The Cuban revolution, however, was not known to engage in international terrorism; no bombs were detonated at US embassies and no diplomats were targeted. Fidel’s initial reaction was to give a fiery, solemn, and poignant speech during a memorial rally for Guevara on October 18, speaking directly to some of the points raised in the classified reports circulating at the highest levels of the US government. Insurgencies continued, as did US-led counterinsurgency operations, particularly in Central American countries like Guatemala, El Salvador, and Nicaragua. Indeed, with Cuban logistical and training support, within a decade of Che’s execution the Sandinista National Liberation Front had become a formidable movement and would eventually overthrow the Somoza dynasty. Officials in Washington were mistaken if they believed Guevara’s ideas, concepts, and committed resistance would be buried along with his body. His failed guerrilla-warfare tactics may not have been inspirational, but his martyrdom at the hands of the CIA certainly came to be. The fate of Gustavo Villoldo’s memorabilia also illustrates Guevara’s iconic and romanticized legacy. Villoldo eventually decided to auction off his scrapbook on the execution of Che; the auction was conducted on October 25, 2007, by Heritage Auction Galleries of Dallas. Initially, the minimum required bid was $50,000. But after the auction company received an inquiry of interest from the government of the late Hugo Chávez in Venezuela—Chávez presumably intended to acquire the hair and return it to Che’s family in Santa Clara, Cuba—the minimum bid was doubled to $100,000. When the scrapbook went on the auction block, however, there was only one bidder—a Texas bookstore owner named Bill Butler, who agreed to pay the $100,000 plus a $19,500 sales commission.